Four undergraduate Psychology majors deserve recognition for their research and recent attendance of the Association for Behavioral and Cognitive Therapies convention in Chicago in November. Senior Psychology major, Kathryn Gallagher, was one of only three students from UNCW to win a statewide 2006 Summer Research award from the UNC General Services Administration. The $3500 award allowed her to conduct research over the summer on women's alcohol use and sexual assault risk. In addition, it provided her with travel funds to attend the conference. Three undergraduate Psychology Majors received CSURF Chancellor's Gold Travel awards through the UNCW Honors program to attend the conference, as well. The students were seniors Shahena Dar and Gerald Benton and junior Benjamin O'Brien. 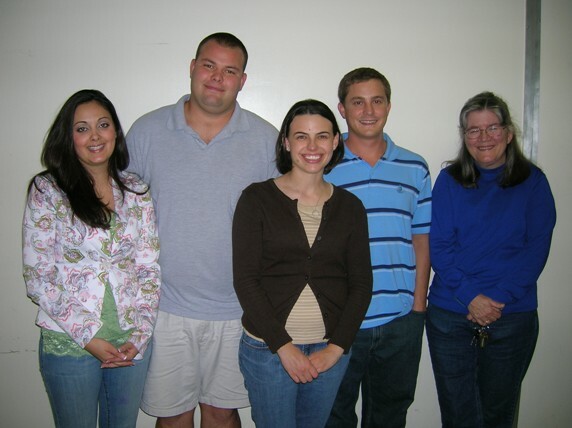 All four students work in the Behavioral Examination of Alcohol, Caffeine and Health Laboratory (BEACH LAB) under the supervision of Dr. Nora Noel. - Shahena Dar graduated in July 2007. - Gerald Benton graduated in December 2006. - Katie Gallagher graduated in May 2007. - Ben O'Brien graduated in May 2008.